A Christening/Baptism is a very important time for the parents of a new baby, and finding the right gift can really show them how much their baby means to you. With so many unique gift ideas to choose from, you want to make sure you choose something that comes from the heart that the parents will appreciate. Don’t let the gift ideas for Christening overwhelm you, this list should give you plenty of excellent ideas. Consider this list of 5 thoughtful and considerate gifts ideas for a relative or friend’s baby for their Christening. 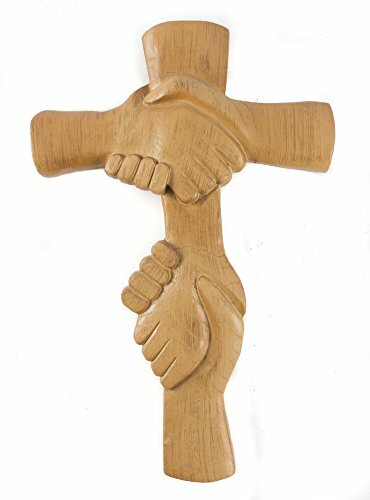 The cross is very symbolic for a christening, and this entwined hands design is quite unique. The child may have a cross with Jesus already hanging in their bedroom, but this very thoughtful gift idea is representative of the hands of the Lord and will certainly be something the family cherishes for a lifetime. This stunning piece of art has a wood finish and a hook already on the back for easy hanging. This is that one gift idea people will be asking about for years due to its incredible detail in the design. 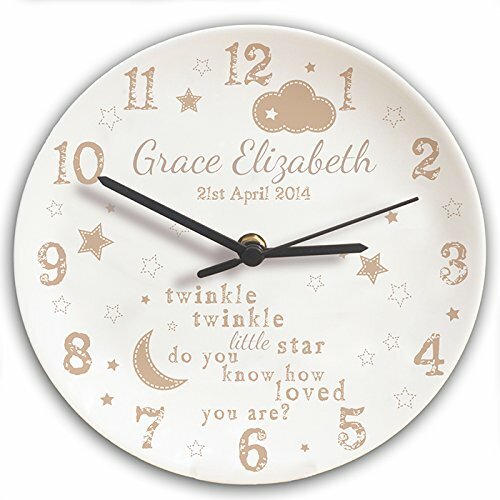 This wall clock for the child’s bedroom makes the perfect Christening gift because in addition to it reading part of the Twinkle-Twinkle song, it can be personalised with the name of the child. The face of the clock even has room to add the date the child was born. This keepsake is something the family will look fondly upon each time they look up to see what time it is. Clock runs on a single battery and has a hook on the back for hanging easily on any wall. Neutral colors and baby theme mean this gift idea will match any decor in the baby’s room. Looking for a Christening gift idea the child will be able to look back on well into their later years with fondness? 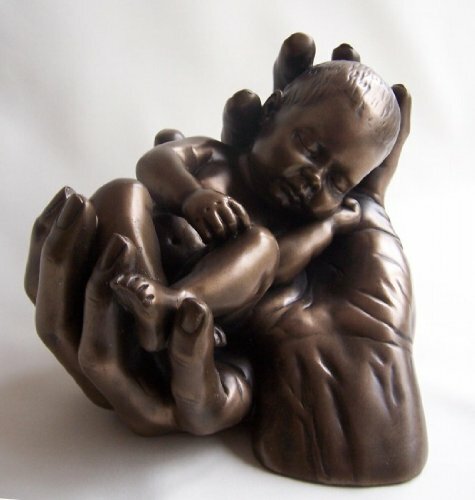 This bronze modern art of a baby in Father’s hands will certainly be something the family keeps on display for many years to come. This is the perfect Christening gift because it represents the Lord holding and protecting the baby in his hands today, as they begin this lifetime journey together. This gift is made to last, and will always remind the child of the person who put so much thought into it and that they are now safe in God’s hands. This gift idea is not only adorable, it is practical as well. 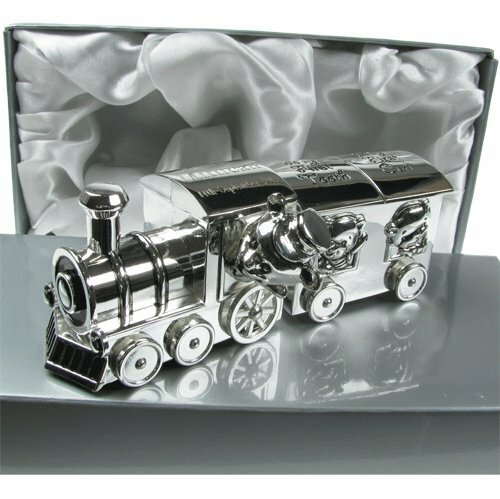 This silver plated train set has space on the top of the trains where the child’s name and their birth date will be engraved. The two carriages have special compartments that the parents will utilize as the child gets older. The first is marked “my first tooth”, and the top can be removed to place the babies first tooth. The second reads “my first curl”, a place for parent to place a lock of the baby’s hair. This cute and thoughtful gift idea will be something the parents and some day child, will cherish forever. There are some aunts, uncles, or friends, who just can not get serious even during a Christening. These fun-loving family members or friends mean well when they choose silly gift ideas for the baby, and the rest of the family loves them for it. What parent wouldn’t be proud to put their son in a “godson” onesie that referenced perhaps the biggest blockbuster movie of all time? This gift idea is still from the heart, but allows the giver to still show their goofy side during a special time in the family’s life. 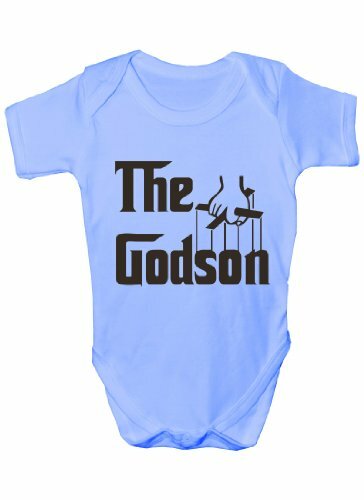 Certainly, this “godson” onesie will be something family and friends will be talking about each time the little guy is crawling around in it. These 5 gift ideas for Christening are all from the heart and will show the family you care enough to remember their child on that very special day.